Freetown, 6 March – Former President Goodluck Jonathan has urged the people of the West African nation to conduct peaceful and credible polls. 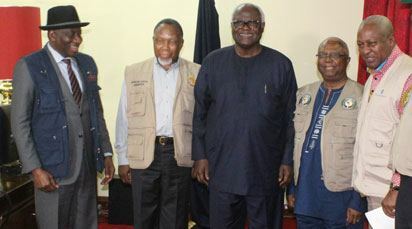 (L-R) Former President Jonathan and head of Electoral Institute for Sustainable Democracy in Africa (EISA); former Deputy President of the Republic of South Africa Kgalema Petrus Motlanthe and and head of the African Union (AU) Mission; Sierra Leonean President Bai Koroma; Liberia’s former Interim President Prof. Amos Sawyer and head of ECOWAS Mission as well as former Ghanaian President John Mahama who is leading The Commonwealth. By cocoriko.